If your area gets a lot of rain, you may be cautious about your landscaping. After all, you need to keep the rain away from the foundation of your home and off the lawn where it can become muddy and unstable. A French drain system can solve these problems without being an eyesore. Once pipes have been installed in your lawn, they can begin to divert water away from your home. Some homeowners find regular pipes unattractive due to their bright, white color and lack of cohesiveness with the rest of their landscaping. A French drain system can be an effective way to move water away from your home without any exposed pipes. A major benefit of installing a french drain system to combat yard drainage problems is it can be completely invisible. At Johnson’s, we cover the system with a thin layer of sod and grass, so it blends perfectly with your lawn. 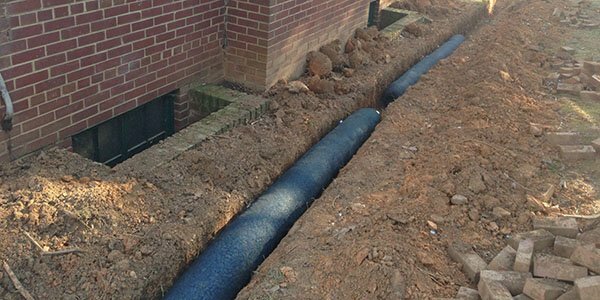 For french drain systems we surround the pipe with gravel and a layer of fabric, so the system is completely self-contained. You can also buy french drain systems as contained units. The sheerness of the fabric and small size of the gravel allow water to pass through to the pipe within. A French drain system can fit into lawns of any shape or size. Our landscape designers can design around your existing plant ecosystem. They’ll build around your plans to give you a French drain system that fits naturally into your yard as if it were designed to be there from Day 1. If you get a lot of rain and are concerned about the problems it can cause, a French drain system might be the right move for you. Contact us to get started with this functional and attractive project for your property.